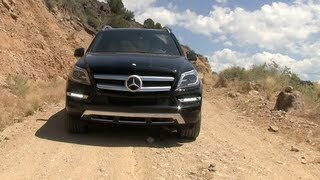 Mercedes GL-Class SUV received a brand new trim level this year with the introduction of the GL350 BlueTEC. As expected from Mercedes, this year's GL brings lots of improvements to the table both inside out and aims to deliver a more powerful yet efficient powertrain. Spaciousness is also one key element on which the German manufacturer focused to improve so it all seems quite promising so far. The GL350 is motivated by a 3.5 liter turbodiesel V6 unit that's able to deliver 240 horsepower and 455 lb-ft of torque. That's quite impressive to say the least, but it's not the only thing impressive about this SUV. The new GL350 is also equipped with a 7-speed automatic gearbox whose job is to send the engine's power to all four wheels via the highly-acclaimed 4MATIC all-wheel-drive system. With the new model a whole lot of new technologies are introduced, including the AIRMACair suspension system that has the ability to auto-adjust itself depending on the road conditions. In addition the AIRMATIC system offers an optional On/Off-Road package that enables the driver to raise the SUV 12 inches from the ground. The optional package also includes a skidplate, a two-stage transfer case with reduction gearing and a longitudinal differential lock. The list of standard features that are to be found in the new SUV includes genuine Eucalyptus wood trim, leatherette upholstery, sunroof, heated 8-way power-adjustable seats at the front, a dual-zone climate control, rearview camera, Bluetooth connectivity, power-operated seats on the third row and power-operated liftgate, a set of 19-inch alloy wheels and a sound system that includes HD radio and a six-disk CD/DVD changer. Optional extras include a Bang & Olufsen sound system, a new set of 20-inch wheels, a trailer hitch and a surround-view parking system just to name a few. Safety features include Crosswind Stabilization, adaptive airbags (front, rear, knee, curtain and side airbags) that deploy in two stages and Collision Prevention Assistconsisting in a radar-based system that monitors the distance between the GL and the vehicle in front between speeds of 20 and 155 mph. Once the system senses that collision is imminent it will automatically apply the brakes. 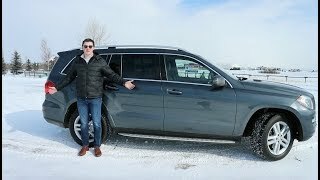 Price-wise the Mercedes Benz GL350 2013 is rated at $62.400, but in case this is not exactly the SUV you're looking for you might want to take a look at the BMW X5, the Audi Q7 or the Volkswagen Touareg.